Here is my solvent cement primer, pun intended. Modern plumbing pipe, especially drain pipe, is almost all plastic. Most of the plastics involved must be joined with glue, solvent-cement. This makes knowledge of the plastics and the solvent-cement for each important. This isn’t rocket science, but neither is it “falling-down simple.” You don’t have to see many DIY plumbing jobs to find simple things that were done wrong. Yet it doesn’t take too much to get it right! As always, my first concern is safety and proper sanitation. Safety includes both those who will use the systems and those who install them. So let me get you started with this page. As always following instructions is primary so be sure to READ and OBEY all the cautions for using any solvents, cements, or glues. There are three plastic plumbing pipes that are put together with glue. They are ABS, PVC, and CPVC pipes. We don’t really call it glue, but solvent-cement. None of the plumbing cements are interchangeable, each one is specific for its pipe. Each pipe is joined with its own cement. One exception is transition cement, used to weld ABS pipe and PVC pipe together. This transition cement is green in color so it's easy to recognize. The other exception is all-purpose cement which can be used to join any of the three pipes to each other. You may wonder why one would purchase transition cement to join ABS and PVC when all purpose cement will do that and more. The answer is simple, when I join ABS and PVC on an inspected job my inspector will want to see green glue. How else could he be certain the joint was made properly? Frankly, I would make the same call. PVC pipe must be prepared for cementing or the cement won't create a proper weld. This is done by applying PVC primer to the surfaces that are to be joined. After being primed the surfaces may be cemented. Many people think that the “Rain-R-Shine” PVC cement does not require priming. This is only true when the joints being cemented are part of a DWV system. “Drain waste and vent” systems are non-pressure. All other uses of PVC, like irrigation, require primer regardless of the cement used. CPVC and ABS pipes don't require a primer. According to the folks at Oatey, CPVC cement may be used without primer where local codes permit. This tells me that the priming of CPVC is not necessary. There are other variations in each solvent-cement, but that's mostly the color and thickness. Thickness is expressed as light, medium, or heavy-bodied cement. The choice of thickness relates to the temperature the cement is used at, and the set up time upon use. The solvent cement you use should allow you time to rotate and adjust the fittings you install before they seize or set up. These joints, when you do them properly, really are welds. Once they're set, they're not going to move again! The cans these products come in have a tendency to glue themselves closed after use. When you first open them, before you smear product onto the threads of the can and lid, coat the can threads with a lubricant. For this I use "Hercules Pipe Joint Compound", it is always close to hand. You won't find any pliers marks on this can lid. These products tend to cure, or "dry up" on the shelf between uses. 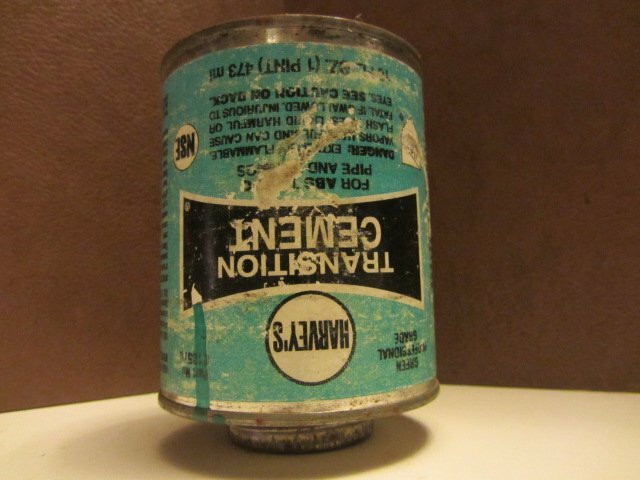 It is annoying to think you have what you need for a job and then find yourself going out to repurchase a can of solvent cement you looked right at but did not shake or open to see if it was still viable. 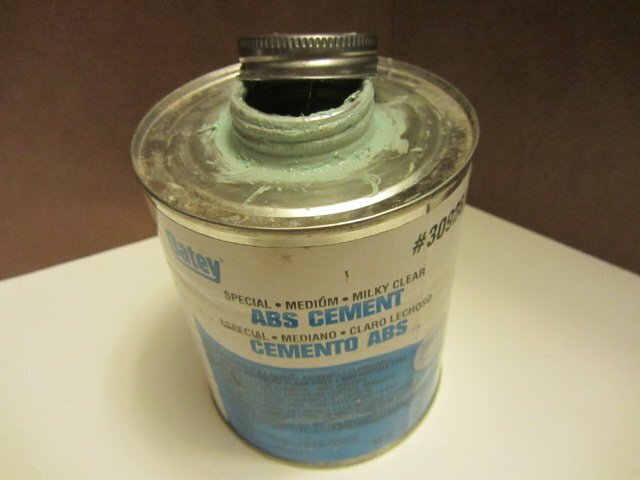 I store my cans of cement upside-down. If the solvent tries to evaporate it will seal itself when upside-down. Cans of primer must be kept right-side up, not even on their sides, or they will leak out. I hardly ever use this can of solvent cement but as old as it is, it's still fluid and ready to go to work. At our home, I'm known as "Mr Fix-It". The whole family knows that if they break something, I'll try to fix it. After all, what have they got to lose, right? It is already broken. Whenever I'm trying to repair something that requires the rejoining of broken plastic, I test that plastic with the various solvent cements I have. The one that, when applied, causes the plastic to “melt slightly” on the surface, will be the weld for that material. This tip is good to know since so many things are made of ABS or PVC plastic!